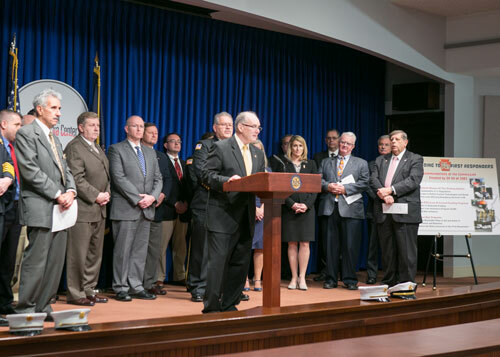 On Monday, Jan. 23, Rep. Rosemary M. Brown (R-Monroe/Pike) attended a press conference at the Capitol where leaders of the House and Senate Veterans Affairs and Emergency Preparedness committees announced a package of bills that are being introduced to assist Pennsylvania fire departments and EMS organizations. Brown is the sponsor of one of the bills included in this package, seeking to partner CPAs with volunteer firefighter organizations. House Veterans Affairs and Emergency Preparedness Committee Chairman Steve Barrar (R-Delaware) is pictured here speaking in the Capitol Media Center. HARRISBURG – On Monday, Rep. Rosemary M. Brown (R-Monroe/Pike) attended a press conference at the Capitol when leaders of the House and Senate Veterans Affairs and Emergency Preparedness committees announced a package of bills that are being introduced to assist Pennsylvania fire departments and EMS organizations. Brown is the sponsor of one of the bills included in this package. Brown’s legislation seeks to create a program for certified public accountants (CPAs) to assist volunteer firefighter organizations. It would establish a four-year continuing professional education (CPE) pilot program for CPAs who volunteer their time to assist volunteer fire companies with their financial records. As a result of the pilot program, up to 40 hours of CPE may be earned; a CPA’s time spent on reviewing a fire company’s financial records may be used toward the renewal of his or her license and a waiver of the biennial license fee; a CPA may only review financial records and may not perform an audit; oversight of the CPA would be conducted by the CPE program sponsor; and CPAs would be assigned by the CPE program sponsor. The CPAs can offer recommendations and suggestions about how to better organize and structure a fire company’s finances. Pennsylvania is composed of 97 percent volunteer firefighter organizations and has about 12 percent of the entire nation’s firefighters, with their services saving taxpayers approximately $8 billion-$10 billion every year. Brown’s video comments from after the press conference are available on YouTube.com/RepBrown. For more information about any state-related issue, contact Brown’s district office in East Stroudsburg located at 143 Seven Bridge Road, by calling 570-420-8301. Information can also be found on online at RepBrown.com or Facebook.com/RepRosemaryBrown.